Eh the Lima still has its problems. My old one had 240,000 when I wrecked it and I had low compression in cylinders 2 and 3. Never heard the 7.3l were that tough- Ill have to check them out. Yeah, the inline 6s were just ridiculous. Id love to find a 96 F150 with an inline 6 and an m5od Never heard the 7.3l were that tough- Ill have to check them out. Yeah I remember waiting for tires at Firestone a couple years ago, there was an article in a magazine I was reading, it was some guy who did a 7.3 swap on it. The guy who did the swap was talking to some guys who owned many 7.3's and one had like 750,000 miles on it, still chugging away. I have a 91 7.3 idi. Great motor. Runs awesome. Have never heard of an issue with them that is known such as the 6.0 issues. I just picked her up a couple months ago so its the previous owner that hardly drove it. Don't worry tho, Its my daily so its not going to be babied anymore! With just over $3,000 in repairs after effectively sitting for the last 11 years, the '97 made a smooth run from Tennessee to Maryland--700 miles--very smoothly. Repairs were for AC, rear shocks and clutch work (master and slave hydraulic cylinders, flywheel and pressure plate along with other associated hardware). 2.3L four ticked right along, cruising through the mountains on I-81 at 65mph giving me 24mpg average. Still has a slightly confused fuel gauge and AC relay clicks on and off much too quickly when engine is at idle; think the idle may be set too low for when AC is turned on. Last edited by Vulpine; 07-22-2015 at 10:43 AM. I should hit 200,000 either tomorrow or Friday. I'll post when I do. 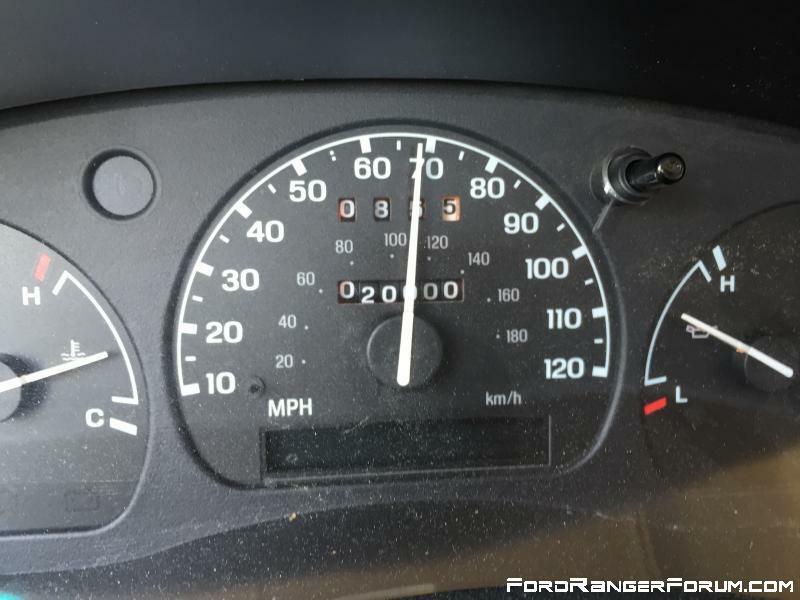 Cracked the 20,000 mile mark on Sunday, July 19, 2015. Last edited by Vulpine; 07-22-2015 at 10:41 AM. 83 ford ranger here with 99k or is it 199k? lol. I trust the previous owner and he claims it hasn't rolled over yet.